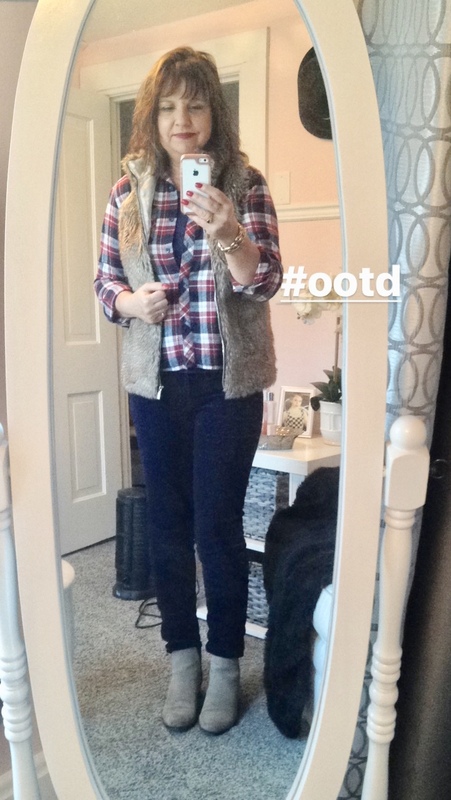 Amy's Creative Pursuits: Four Months of Instagram Selfies! Since I took a blogging break, I haven't been taking fashion photos of my outfits. I have however tried to take selfies of my "Outfit Of The Day" and posted them to my Instagram Stories. Here are some of those outfits. This is a new knit top I picked up at our town's Younkers "Going Out Of Business" sale. I think I paid only $3.00 for this top. It is super comfy with flutter sleeves and pretty embroidery. Hopefully this spring I'll have an opportunity to wear it again and show you better pictures of it. 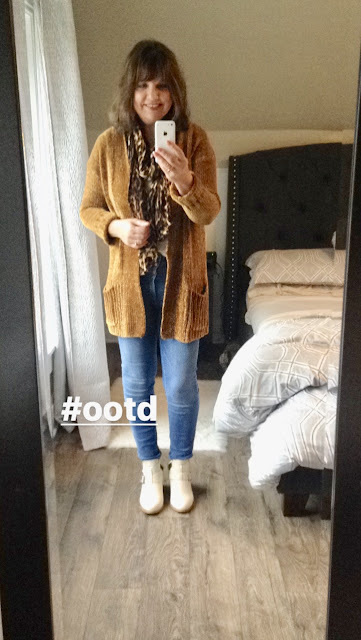 I paired it with olive green skinny jeans and brown suede booties. 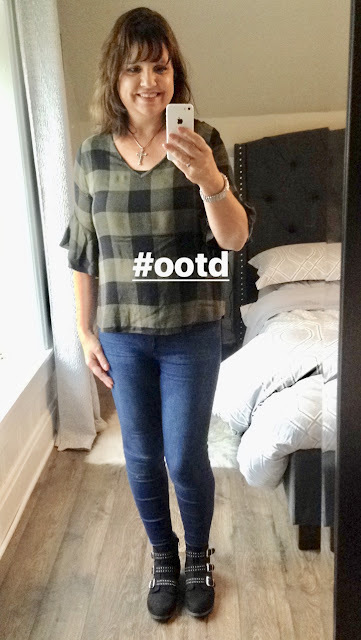 I also picked up these unique ruffled hem jeans at the Younkers "Going Out of Business Sale". I'm not sure I like them. I got a lot of weird looks the day I wore them. Funny thing is, when I see these jeans on other women, I think they are cute, but on me I'm a bit uncomfortable wearing them. I never would have purchased such a trendy item had they not been so cheap. I could always take the ruffle off and wear them like capris too. This was a new top I bought at JCPenney, but I no longer own it because I gave it to my daughter. It was one of those items that I loved in the dressing room mirror but when I saw pictures of myself in it later I didn't like it. The seam was constantly riding up and going right across my bust instead of under it. The only way I could wear it was if I were constantly mindful of pulling it down. I decided it was better suited for my pregnant daughter than for me. When the controversy over the song "Baby, It's Cold Outside" was going on, I decided to show my support for the song by wearing this holiday sweater to church. And that's just a few outfits I've been wearing the past few months! Which one was your favorite? I have started doing this recently. It's nice to see the outfits we wear daily, and I get ideas about how to style items next this way!! 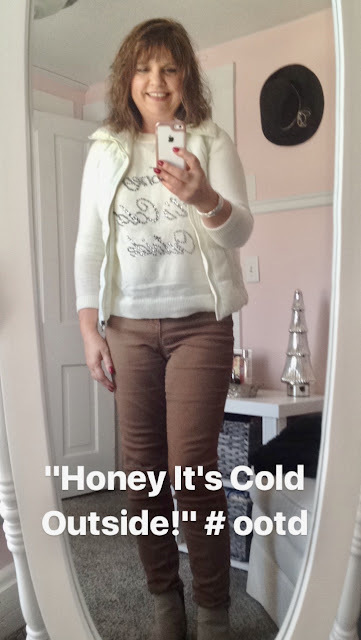 Love that Honey it's cold outside top....super fun!! It’s fun to look back at all your outfits, isn’t it? I love the novelty sweater too, even more so after all the controversy over the song. 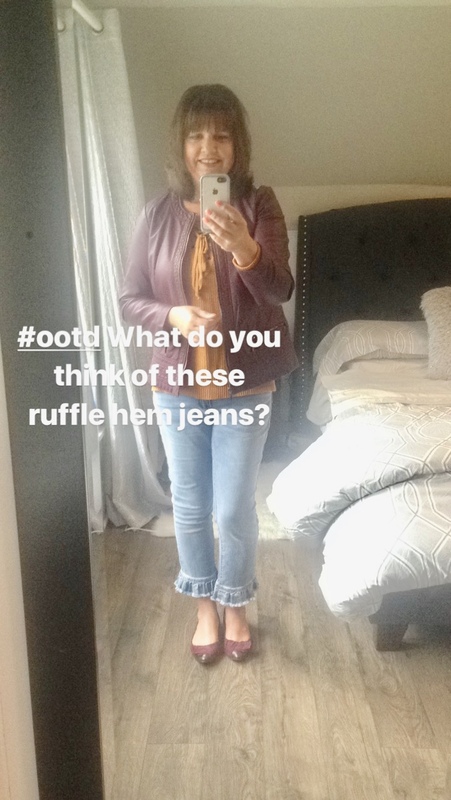 The ruffle jeans one! Fabulous! 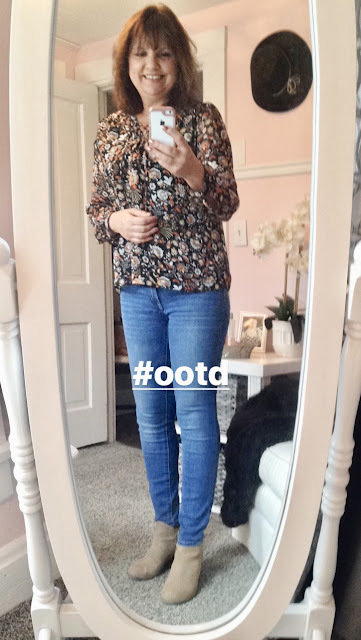 They are all nice looks, but my favorite one is the blue jeans with fall floral shirt. I think outfit #11. The honey it's cold outside is such a cute shirt too, and that song really is one of my favorite christmas songs. What a world we live in to find it offensive!! 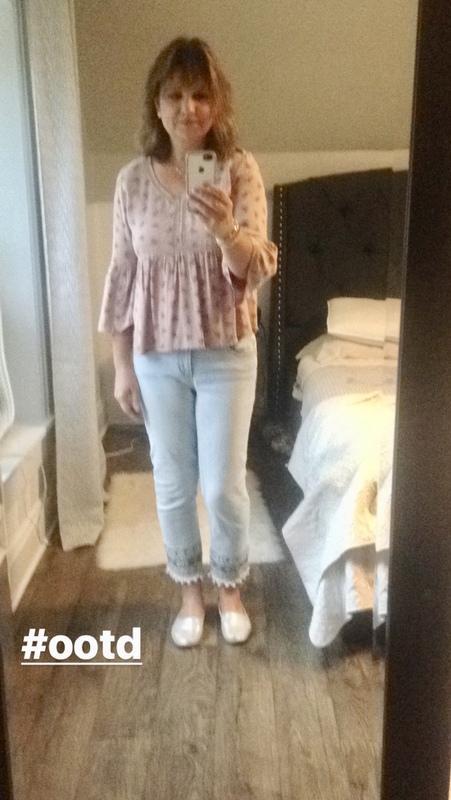 I think the ruffle jeans look really cute. People probably just had a look because they were unexpected. Saw some ruffle pants much like these today when searching Nordstrom's "new arrivals". But I prefer yours over the ones at Nordstrom. Thanks Ellie! That’s so nice to know about the ruffle hem pants. I will have to try them again this spring. 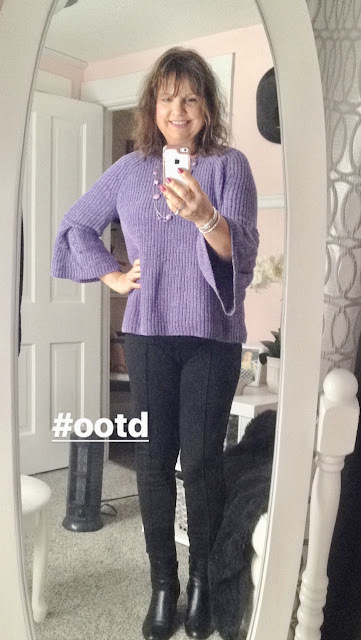 My favorite outfit is the long sweater and leggings but I do like those ruffled jeans; they look super cute on you! 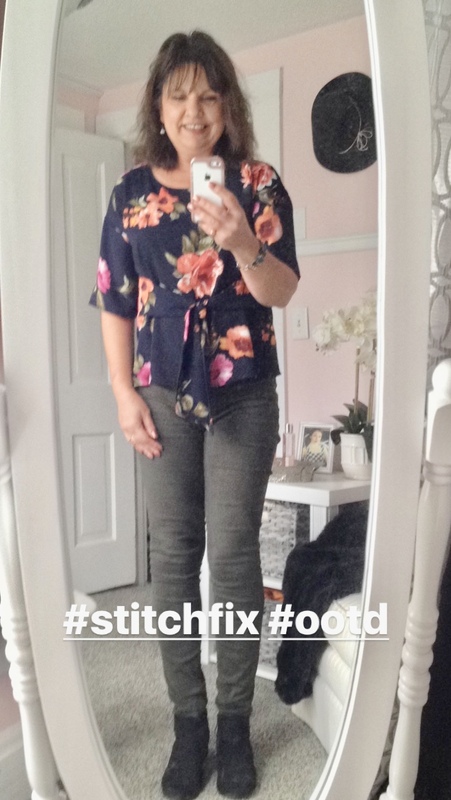 Those ruffled jeans seem to be popular! I think I need to give them another try this spring. Thanks so much! Thanks Mica! Ok, I’m definitely wearing those ruffled jeans more. They were the hit of this post! These are all so cute dear, especially the first one. Love that floral details. You look so cute and young in all these looks. I think you can wear what you want and always look great. It's unbelievable you are a granny! You always look so great! How do you do that? 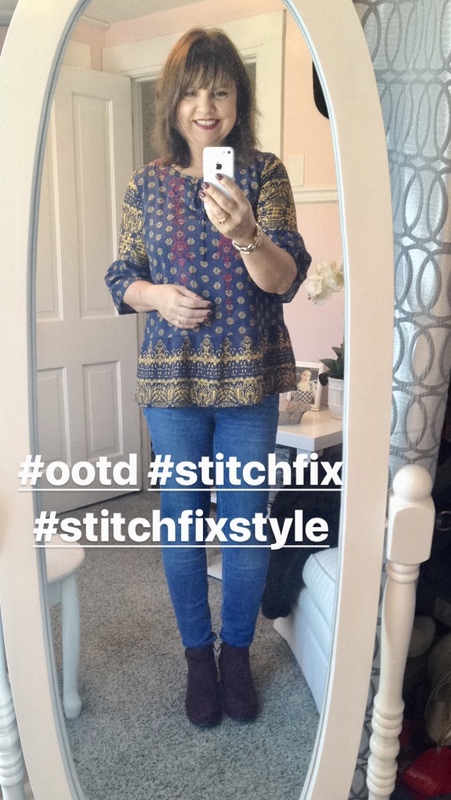 Thanks for sharing your outfit inspirations at the Top of the World Style Linkup party! Nicole, you are always so flattering! I think having a chubby face fills in my wrinkles...ha ha! 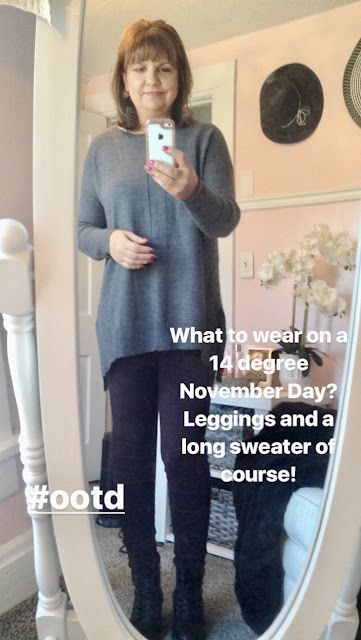 A lovely round up of outfits, Amy. I've been instagramming too, since end-August, and I agree with you. The discipline of posting daily outfits makes me put a bit of effort into my everyday outfits, and it's a great reference library for those days when I need inspo from my own wardrobe! Thanks Mary. 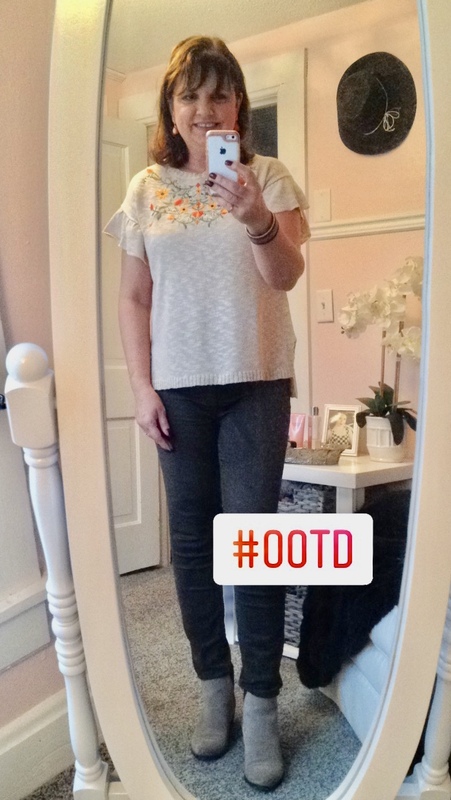 That's so funny, when I have to dress in a hurry and I can't decide to what to wear, I often refer to my Instagram profile for ideas. So many cute outfts Amy! 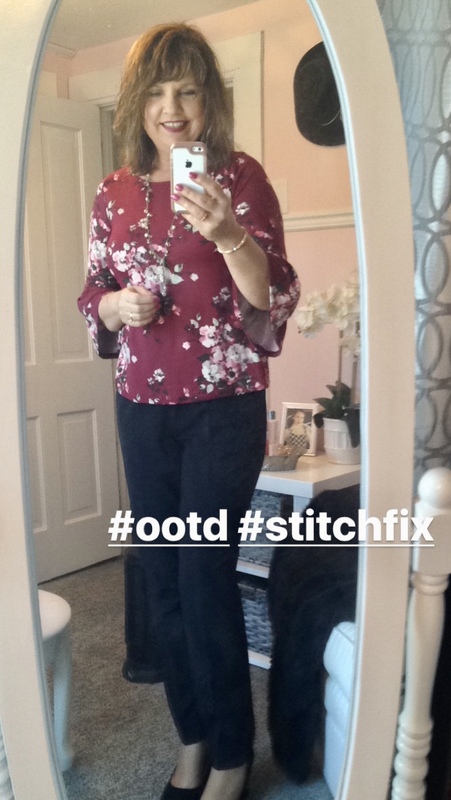 I tend to go for the dark colors , so I love the maroon floral blouse and that mustard card! I love those ruffled hem jeans, Id love a pair. Thanks Jess! Boy, those ruffled jeans are popular with my readers! I definitely need to wear them more. 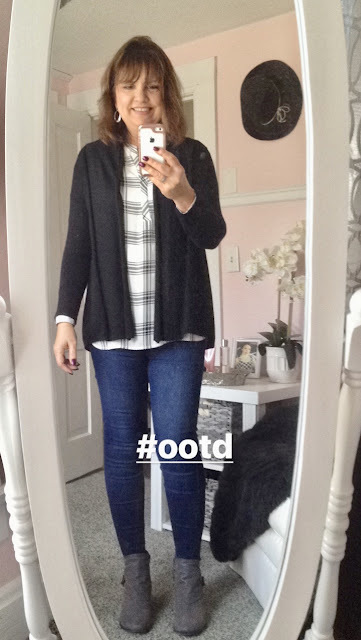 If was fun to take a look at your OOTDs. And, the top you gave your daughter because you didn't like it as much as you thought when you got it home---how does that happen? I do the same thing sometimes! I really like your mustard cardigan and those ruffled hem jeans!!! If I thought we were the same size, I would take them in a heartbeat! Thanks Kim. Sometimes I think dressing room mirrors are magical mirrors...we look better wearing them in the dressing room than in real life. :) I will definitely give the ruffled hem jeans another try this spring. Too cold to wear them now!